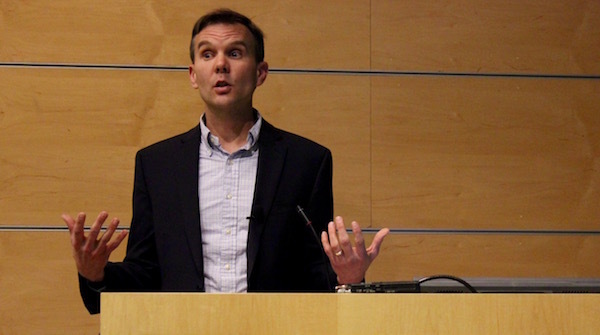 “Blooms like it hot,” said the East End’s algae bloom expert, Dr. Christopher Gobler of Stony Brook Southampton, acknowledging the role of climate change in the ongoing stresses to the East End’s water bodies at his State of the Bays address April 7. Dr. Gobler said at his annual talk at the college’s Chancellor’s Hall that, not only was 2016 the warmest year on record on planet Earth, but new National Oceanic and Atmospheric Administration research this past year shows that Long Island is one of the places where temperatures are warming more rapidly than the global average. Dr. Gobler said new NOAA research shows that summer temperatures on Long Island in July, August and September were averaging just below 20.5 degrees Celsius in 1980, but in 2016 they averaged 23 degrees Celsius. He said this is particularly troubling for wildlife, because warmer waters contain less oxygen than colder waters, which can hasten fish kills in areas that are already facing hypoxic conditions due to other factors, including harmful algae blooms. A toxic blue-green algae bloom in Mattituck’s Marratooka Pond. For the past several years, Dr. Gobler has been one of Long Island’s most vocal advocates for reducing the amount of nitrogen entering the island’s waterways, due largely to the lack of sewage treatment in Suffolk County. Dr. Gobler also said this past year the U.S. Environmental Protection Agency has provided new guidance to scientists on taking both nitrogen and phosphorus into account in freshwater systems, and added that his lab’s research has showed that extra nitrogen increases the toxicity of blue-green algae blooms. He added that new research in his lab has shown that the bacteria Vibrio parahaemolyticus, which causes shellfish poisoning in humans, feeds on decaying algae. Dr. Gobler also said there is also new research being done by the EPA on continuous monitoring of dissolved oxygen in water. In the past, he said, researchers would conduct their dissolved oxygen testing during working hours, but new machines are able to continuously monitor dissolved oxygen levels, with the researcher accessing the data remotely. This is important because dissolved oxygen levels tend to be lowest in the wee hours of the morning, which is also the time that most fish kills happen. Dr. Gobler said that, in a recent study, the EPA found that dissolved oxygen levels were within acceptable parameters 75 percent of the time when measured at 11 a.m., but were only compliant 39 percent of the time when taken at 8 a.m. When taken continuously, the levels were only compliant 3 percent of the time. “The EPA, through the years, has done such a terrific job of protecting water quality, and let’s hope that continues,” he said. The East End’s bays suffered only one major fish kill in 2016, in the Shinnecock Canal in early November, after several major fish kills in the western Peconic Bays in 2015. In all those cases, the bait fish menhaden, known locally as bunker, was the victim. 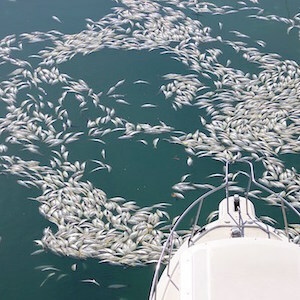 Dr. Gobler said the kill in the Shinnecock Canal was caused by a “somewhat artificial situation” in which menhaden populations had another in a series of banner years, and were migrating out to sea for the winter when they got caught between the lock on the canal and the incoming tide when the lock was closed. He added that changes in seasonal patterns due to climate change could also be influencing the fish. Dr. Gobler said he’s recently adopted the Alcoholics Anonymous mantra of “God grant me the serenity to accept the things I cannot change, the courage to change the things I can, and the wisdom to know the difference,” when it comes to public policy on the environment. He pointed to the regrowth of seagrass in areas where sewage pipes have been moved, changes in the Suffolk County sanitary code in 2016 to pave the way for individual on-site advanced nitrogen-reducing septic systems, the landslide victory of the East End’s Community Preservation Fund referendum, extending the program by 20 years and allowing 20 percent of the money to be used for water quality projects, as steps forward in the past year. He also pointed out that, on the East End, most groundwater takes just a short amount of time to reach the bays, allowing the groundwater in this region to rebound faster than in the center of Long Island. He also expressed hope for an effort by his lab, the East Hampton Town Trustees and a group of homeowners bordering Georgica Pond to harvest macroalgae from the pond for the first time in 2016. The machines used in the program removed 60,000 pounds of seaweed from the water in 2016, accounting for 10 to 20 percent of the summertime nitrogen and phosphorus input into the pond. “If we compare with the harvest and without, the water quality was much better afterward,” he said. 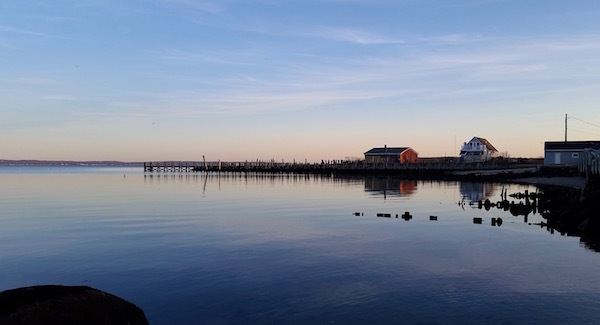 He added that there’s work underway to use harvested seaweed as fertilizer, replacing chemical fertilizers that leach nutrients into the groundwater and eventually the bays. He also touted the Shinnecock Bay Restoration Program’s seeding of Shinnecock Bay with 2.2 million baby hard clams. “People on the bay are saying that, in places where they never found anything but mud, they’re now starting to find shellfish,” he said. Audience members were concerned about potential cuts in federal funding for the National Estuary Program and in the relaxation of EPA clean water standards. “We have a congressman and we have to let him know those are things that we value,” he added.